Sorry, if it's a silly question. 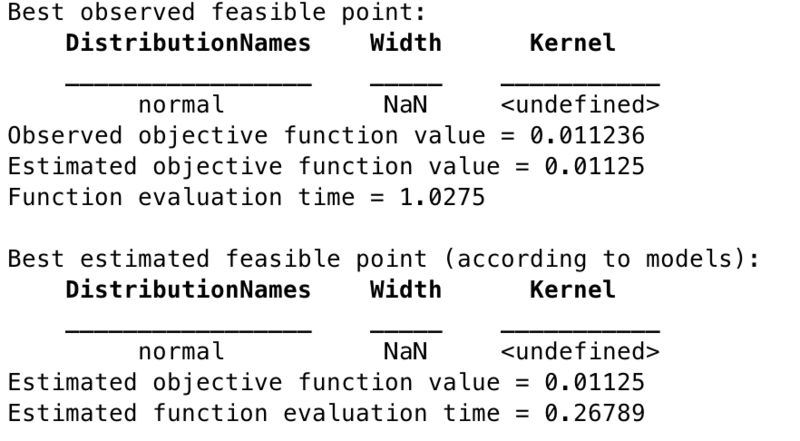 I am using Bayesian Optimization to optimize classifier hyperparameters but sometimes I having "<undefined>" and "NaN" values for some parameters. What do they mean? Dataset is not suitable for this classifier? Should I use classifier's default parameters? Thanks for the help. I would need to see your example to be sure, but a typical case is when some parameter is not used when some other parameter has a certain value. For example, the PolynomialOrder parameter of an SVM is only used when the KernelFunction parameter is 'polynomial'. So a NaN or "<undefined>" value in a parameter vector means that you should not use that parameter.